Tons of pictures, tons of words. You will find a name for every picture found in this quilt embroidered in the borders! i.e. crayon, whale victrola! The love of words and reading is the best gift to give to a child. This would be the perfect gift for a new grandbaby! 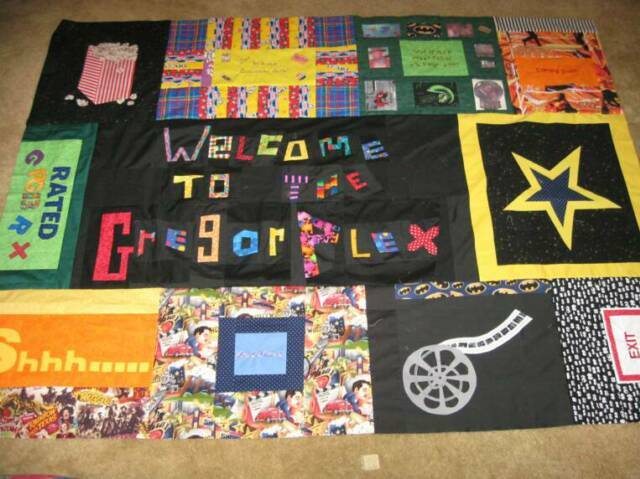 This is a novelty quilt I created for a special couple who has an in-home theater, complete with a marquee, popcorn stand, and lots of movie memorabelia. One of a kind for sure! 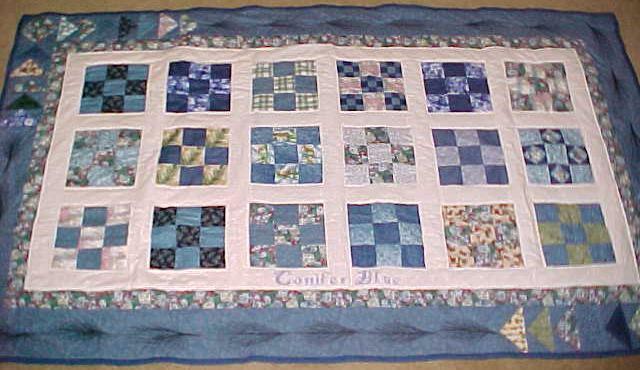 This quilt was given to the celebrating couple along with pigma pens for all of their guests to sign either their name or a fond memory. 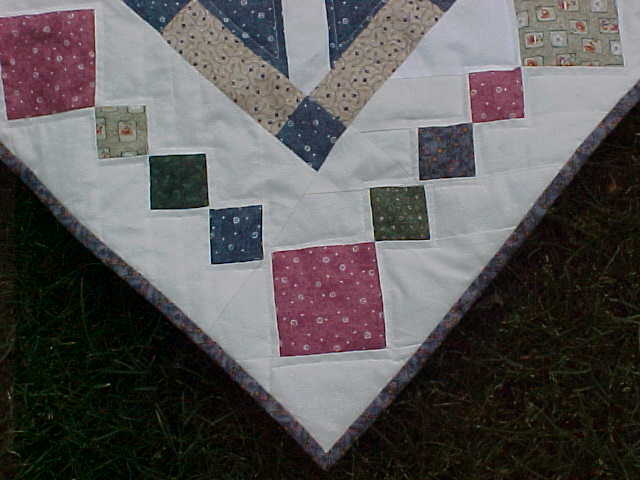 Quilt hangs 12 inches on all sides. Cats Rule!! This is the only picture I have of this quilt. It had safety pins to hold it together as I quilted it. 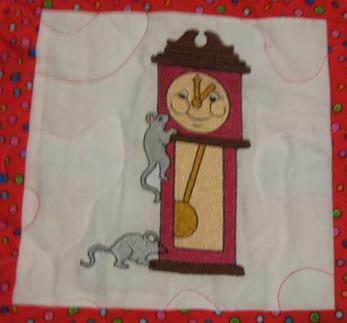 I added eyes and details after the quilting was finished. 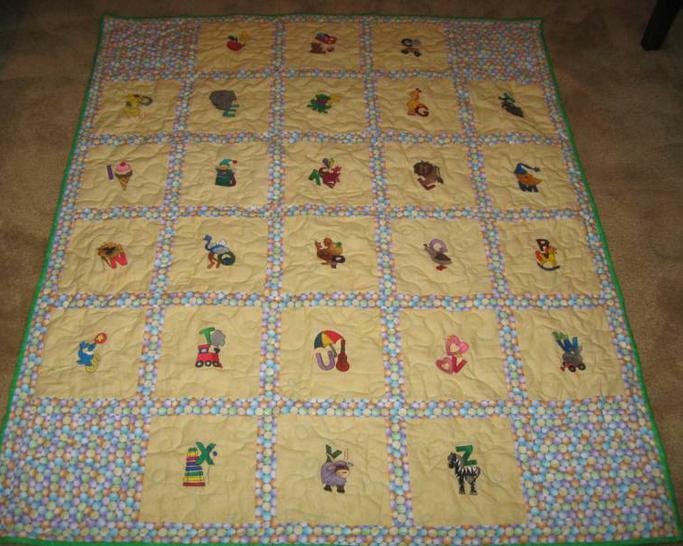 Cute throw quilt for the kitty lover! 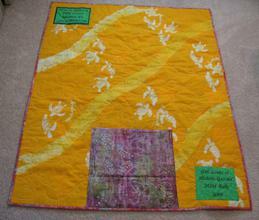 This memory quilt was made from clothing of a very special Grandma. 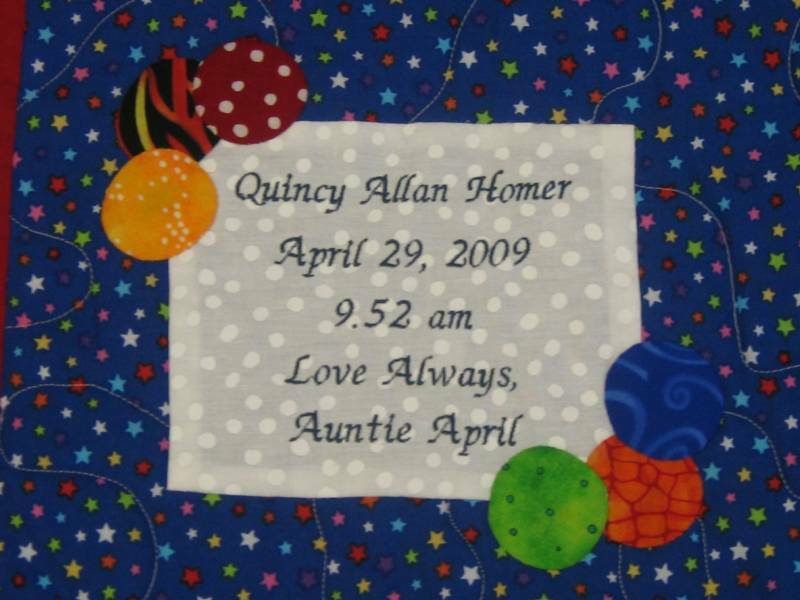 The white squares were left blank to add handprints of each of the grandkids which are going to be embroidered. 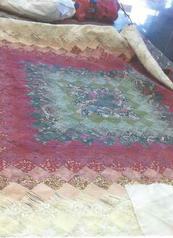 Close up of the quilting in the border of the Monet's Double Wedding Ring quilt shown above. 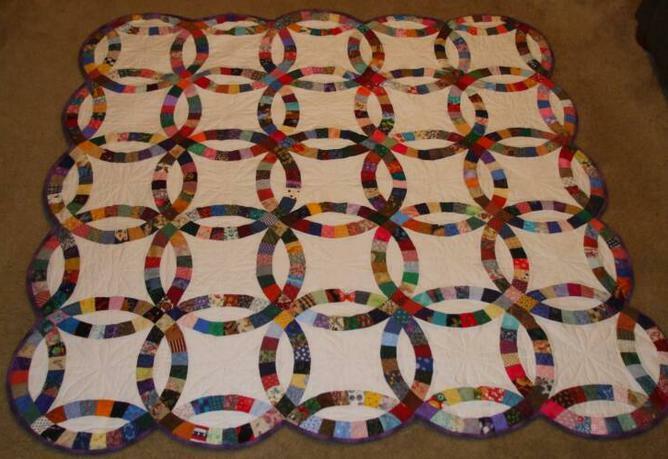 Siggie block throw quilt. Perfect for a reunion. This is a "Quillo". 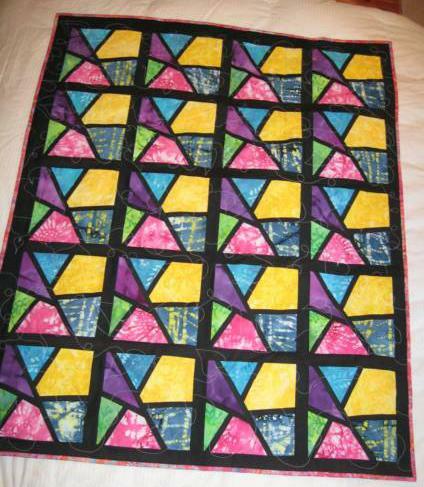 A very pretty throw quilt that can fold in to its own pocket to form a pillow for easy storage. The picture above is the back of the quillo -- you can see the pocket in the bottom center of the back. 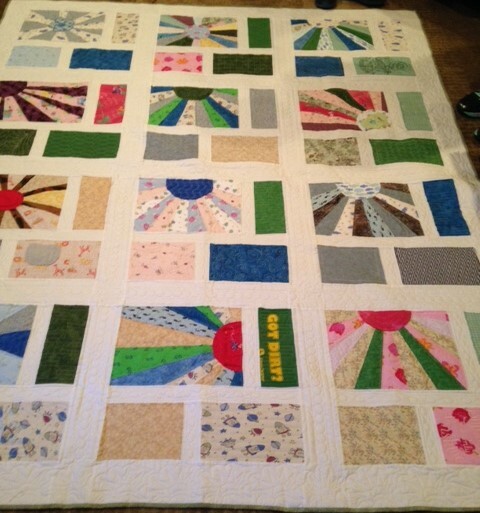 Below is a close up of the quilting. 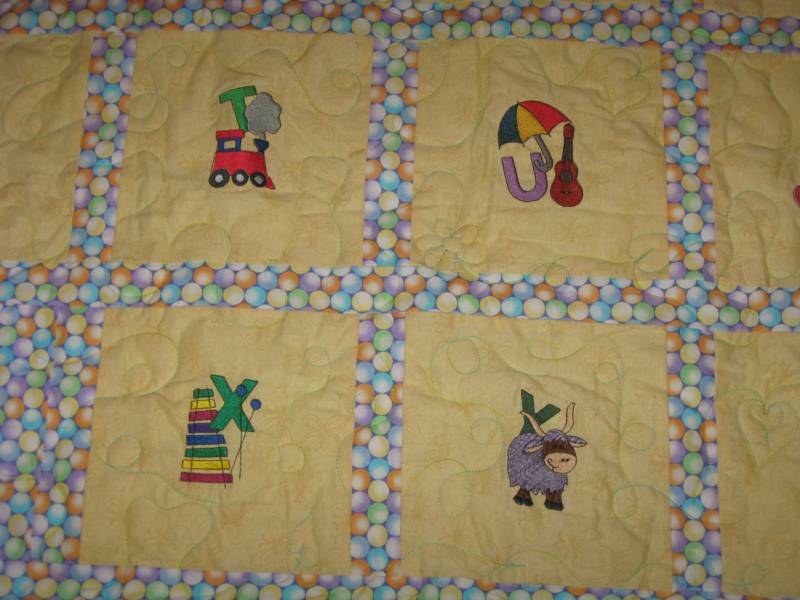 "My Trucks Quilt" Above: Is the signature label where I used extra hubcaps to decorate the label. 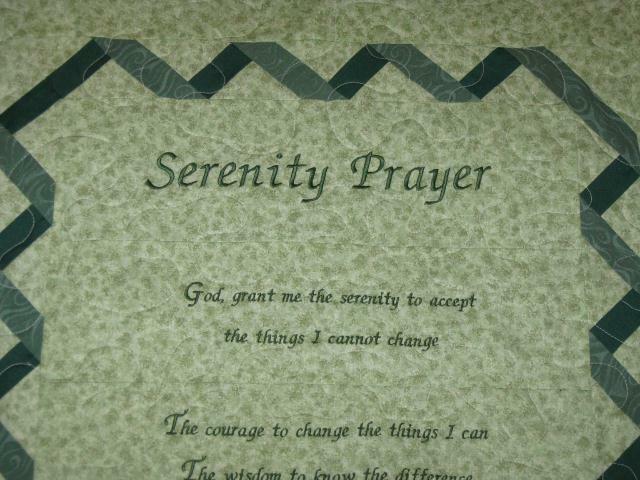 (Left) The full version of the Serenity Prayer as a wallhanging. 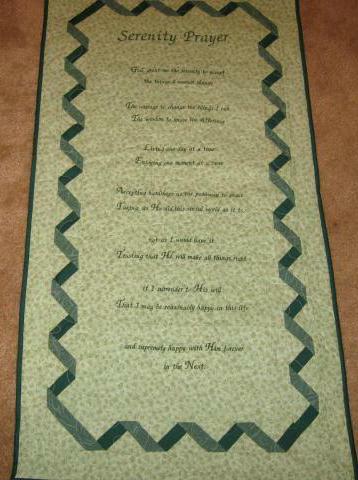 The closeup of the first few lines of the prayer shows the great detail of this wall hanging. 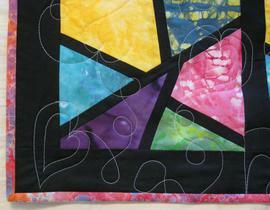 This quilt can be done in your favorite color scheme. I love to play with values. Nice 3D effect. 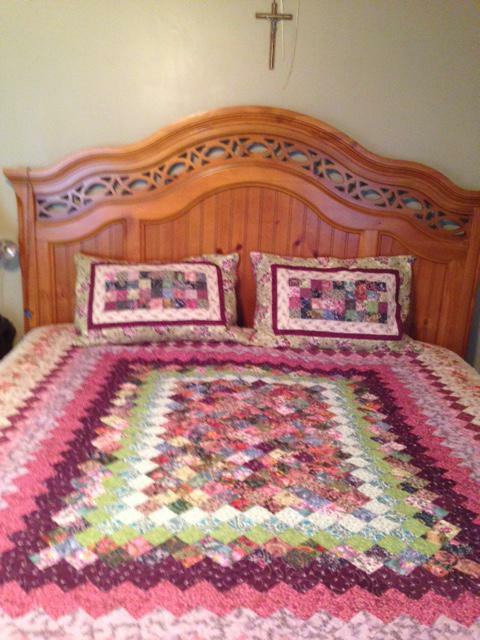 Queen size quilt. This quilt has 4 levels of spying to be done. 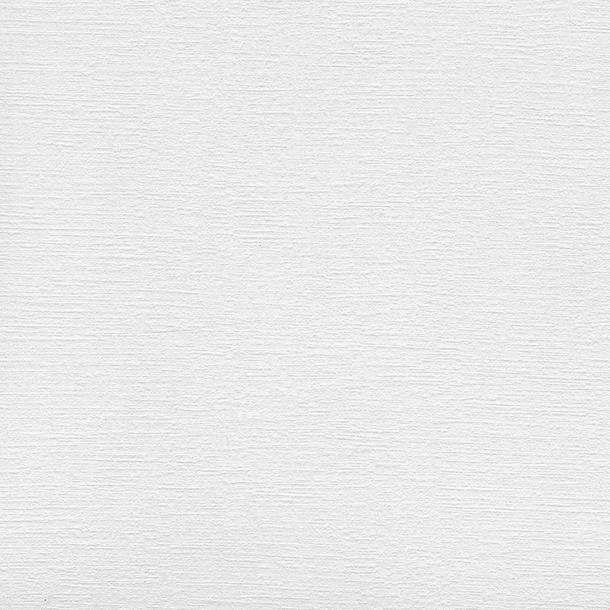 You will find a picture (i.e. a panda) in the large squares; then look through the small squares to find part of a panda; then look in the borders to find a triangle that shows an even smaller part of the panda; and finally, search the binding for the tiniest bit of panda. You might only find his fur or part of his paw. 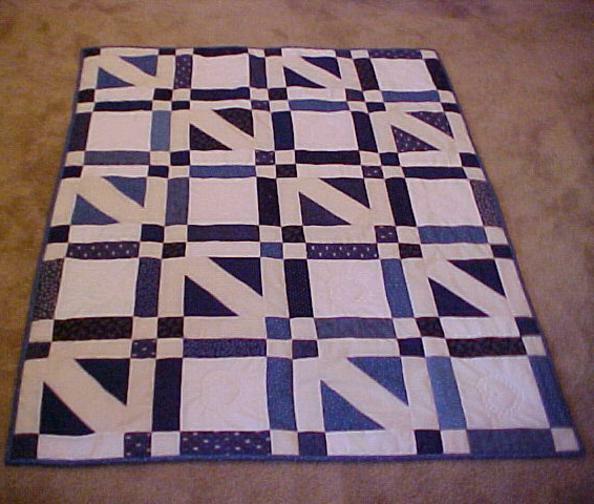 What a fun and challenging quilt. 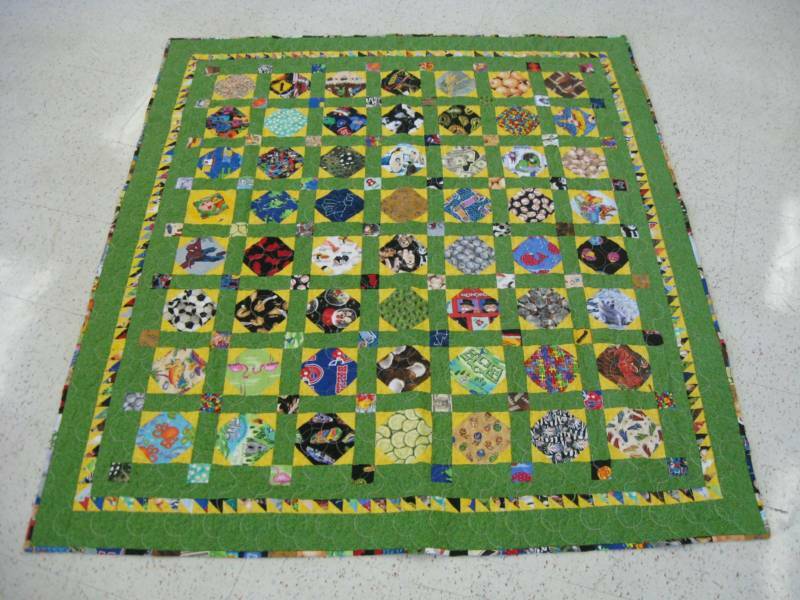 Adults love this quilt too. This is a display of some of my recently finished quilts. While these quilts have already been delivered to their new owners, I can make one just as beautiful for you too! Now I know my ABC's, next time won't you sing with me? 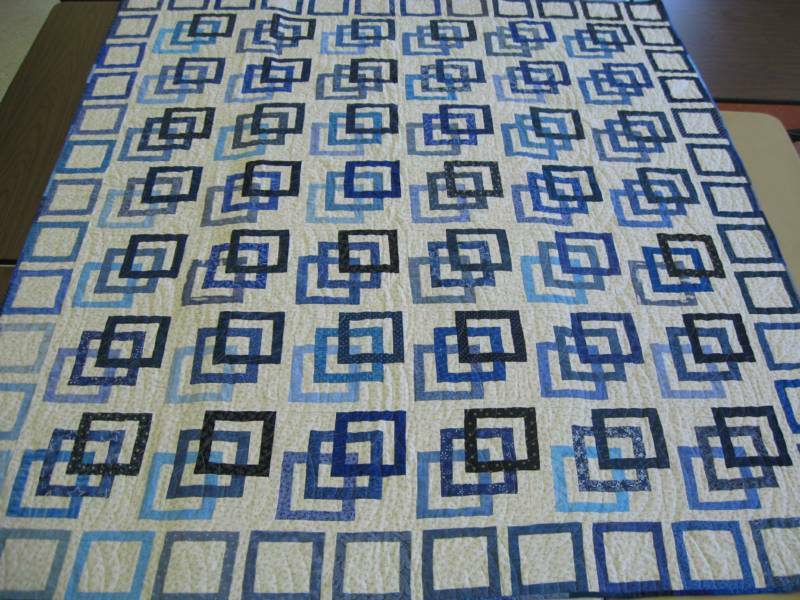 This quilt is a perfect example of how embroidery can be used in a quilt! 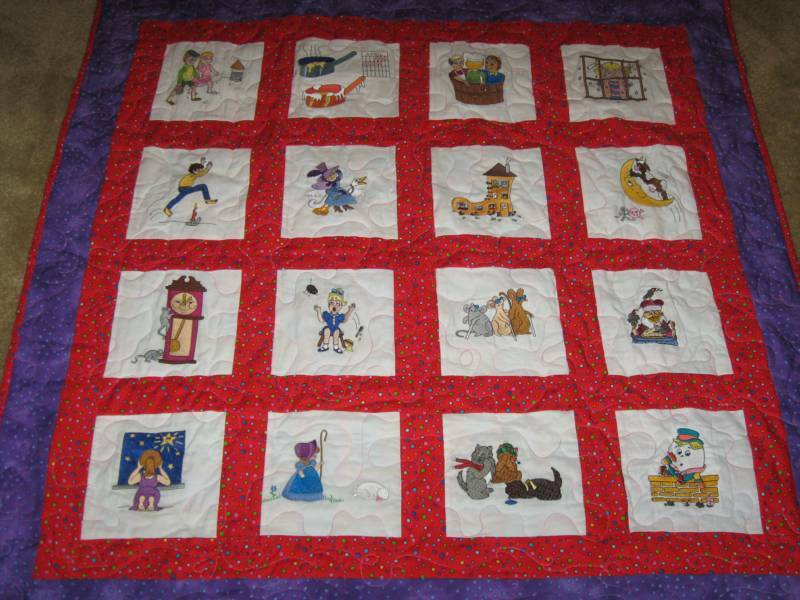 ​This quilt has a lot of bright colors and cute characters from all your favorite nursery rhymes including Hickory Dickory Doc, The Old Woman Who Lived In a Shoe and more! 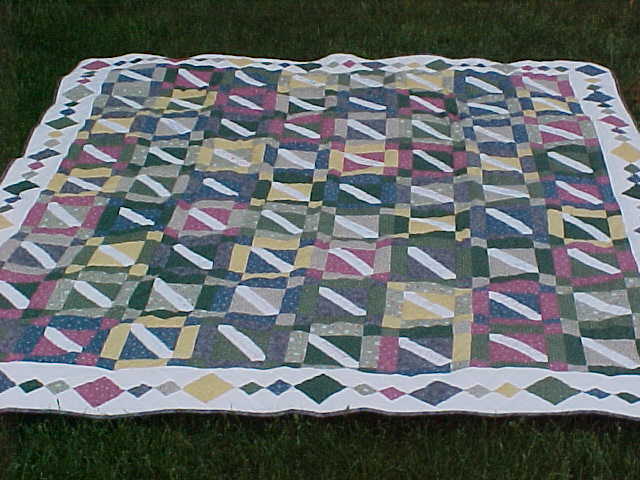 "Double Wedding Ring Lap Quilt"
Made to match a cherished memory! 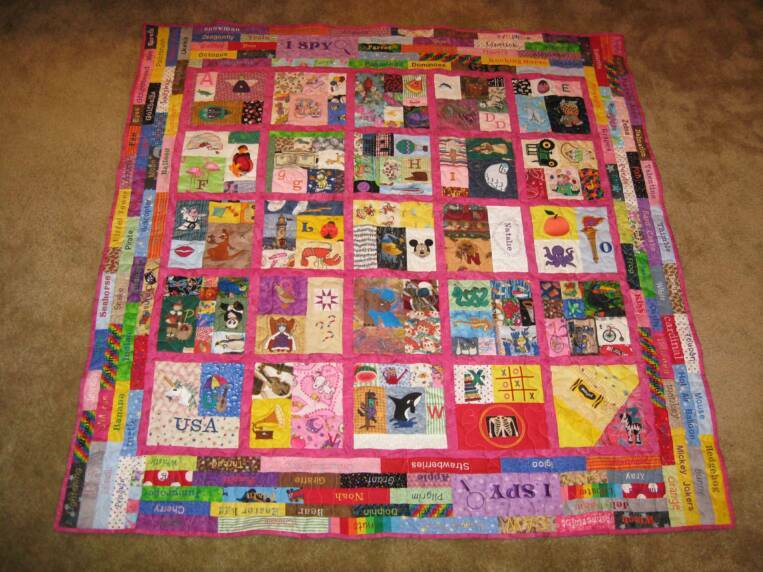 This is a BEAUTIFUL Trip Around the World quilt done in rich florals. 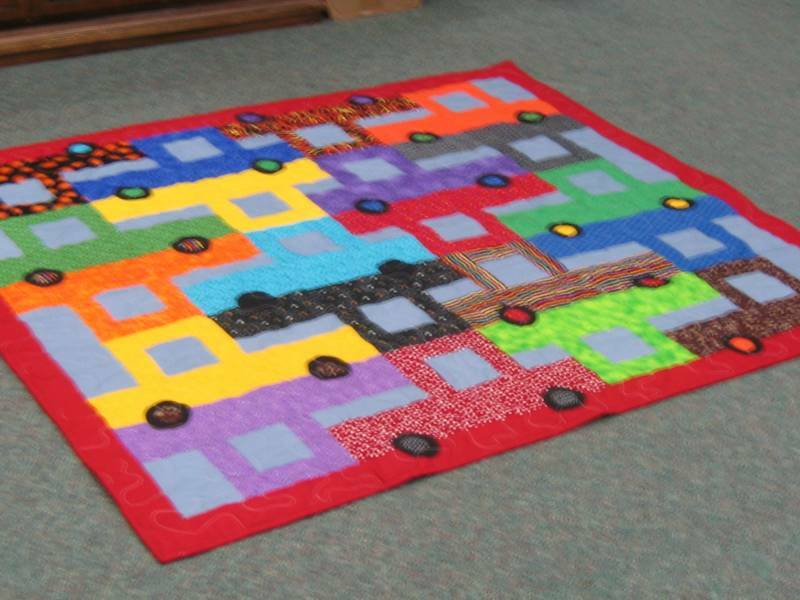 *This project started out as a request from a customer to replicate a very old, worn, and torn quilt which her Mom made 35+ years ago. (See photo to left.) From just a few pictures, I was able to make this King stretch quilt for her. Matching pillow shams are such a nice touch! 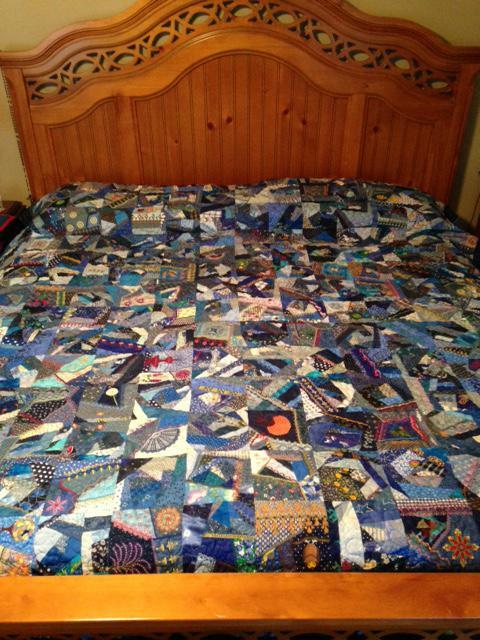 ​This quilt took almost a year to complete. It was worth the wait!